There's no reason to do anything but gaze at the stunning 3000m2 lagoon style pool in the centre of Pullman Port Douglas Sea Temple Resort & Spa with a delicious cocktail in your hand. On second thought, there are several reasons: beautiful Four Mile Beach, a treatment at Vie Spa, first-rate cuisine at AQUA Restaurant, the village of Port Douglas and exploring the wonder of the Great Barrier Reef... That is, when you're ready to emerge from your villa's private plunge pool. Situated in picturesque Port Douglas, Pullman Port Douglas Sea Temple Resort & Spa offers guests access to a whole host of natural delights. Guests staying at this unforgettable Port Douglas hotel can explore the Great Barrier Reef, the Daintree Rainfores t and the spectacular Mossman Gorge, or take a crocodile tour on the Daintree River. For guests who want to stay closer to home, Port Douglas is a beautiful coastal town, with plenty of boutique shops, restaurants and a large Sunday market to discover. With Port Douglas on the doorstep and Cairns just an hour's drive away, Pullman Port Douglas Sea Temple Resort & Spa offers guests the ideal base for exploring the region, including the Great Barrier Reef, the Daintree Rainforest and Cape Tribulation. Elegant and stylish, guest rooms at Pullman Port Douglas Sea Temple Resort & Spa provide a spacious, peaceful haven, allowing guests to relax in total comfort. 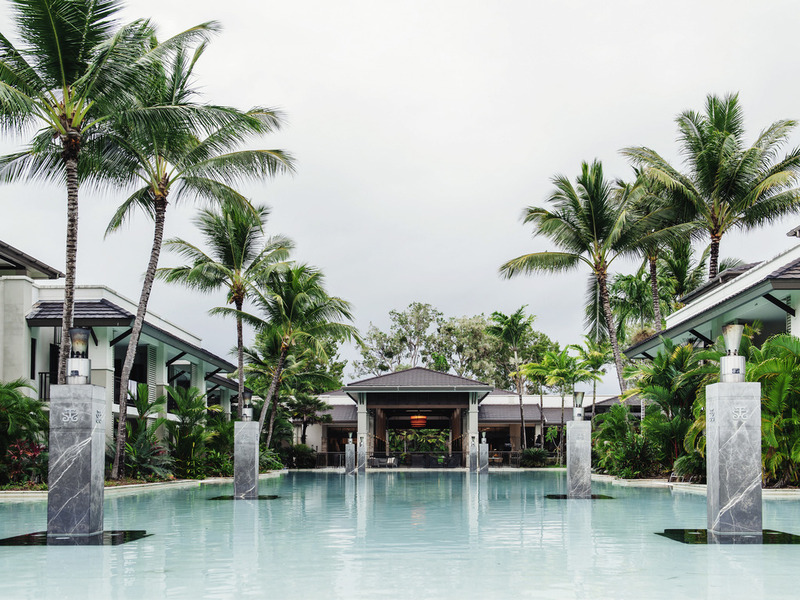 Guests looking for hotels in Port Douglas can choose from a range of accommodation options, inc luding Studio Spa rooms, one, two and three bedroom apartments and three bedroom villas, as well as swim-out apartments, plunge pool apartments and penthouse apartments. Each room is tastefully appointed, containing everything required for a restful stay. A world away from the everyday with simplistic elegance, escape the every day and embrace the destination through our unique regional flavours. Rediscover the meaning of relaxation with genuine hospitality while dining by the lagoon pool. For the ultimate holiday experience, park your towel on a sun lounge, order a cocktail then settle in for lunch at the Sea Temple Pool Bar. The Pool Bar offers delicious drinks and cocktails, all day snacks and lunch in a relaxed environment. Only one towel was provided in our room, this was rectified quickly once we notified the front desk. However the curtains in the room when rolled down were unacceptably dirty and not at all nice to look at. They made the room feel unpleasant when they were down. Pool was nice, when we checked into the room there was cigarette butts on the outside patio called reception to have them removed and it didnt happen! Had to wake up the next two morning looking at dirty cigarette butts!!! Housekeeping is not to high standards. We had a deceased pet fly on the windows sill for the week. The bathroom cupboards were all swollen through moisture. The bottom of the pool needs a good scrub to remove brown marks. Room service was terrible although the food in the restaurant was of extremely good quality. Bad idea was to have a weeding in the reception area (who wants drunk and loud people when you are trying to have a relaxing meal in the restaurant!!!). Gardens were very well kept. The doors of rooms 112 and 111 were all dirty and marked and gave an overall grim appearance. I would not classify this establishment as a 5 star hotel. Very pleasant staff, and great pool and facilities. We arrived late to book in, and the two ladies on reception were really helpful. The Restraunt staff were outstanding, both breakfast and dinner. Especially Patrick and Isabelle. Even if the dinner prices were a bit steep. But with the Accor loyalty card, that went some way to addressing that. A mention also for Carlos at the pool bar, very proficient. Room could do with a bit of updating, but didn't detract from the ambiance for the hotel. Bus services from the hotel to the town was adaquate, if you gave them a call they came in reasonable time. Fantastic pool. Room was well appointed and the staff were attentive to our needs and made us feel very welcomed. Only issue was that my wife got a piece of glass in her foot while in our room. Check in was excellent. Room was very clean and welcoming. Staff are a credit to the hotel. Facilities were clean and well maintained. Although we did not use the restaurant it looked very inviting. Overall a very relaxing stay. It has been a great experience staying at this beautiful resort. Staff was very welcoming, friendly and helpful. When requested for an early check-in they have been very accommodating and I ended up telling that we were there to celebrate the birthday. They surprised us with an upgrade. Thank you to the team this made our stay even more special! Friendly and helpful check in, appreciated the up grade and welcome platter. Dining was enjoyable and delicious, very helpful staff, unsure of her name but she came from Taiwan. She was professional, helpful and attentive. I booked a two bedroom penthouse apartment for my birthday weekend. As a gold member I asked for early check in (12 pm). Upon my arrival the room was not ready which was very disappointing. In fact the room was not ready until 1:40 pm and they even had someone cleaning still when we checked in. The room was spacious and luxurious. However there are many maintenance issues- broken sink, dirty shower and tubs, sink tap is scalding and leaks. With that said the food in the restaurant was fantastic and the location near the beach was really nice. Very enjoyable, except for the weather!